Where do I use my Premier Man voucher code? Grab a Deal or Discount of your choice and copy the code if prompted. Follow the link through to the Premier Man homepage. Add your selection of products to your basket then proceed to the checkout. Paste your code into the ‘Promotional Code’ box. After you have filled in the appropriate details, proceed to payment. It's worth taking a look at what there is on offer in the Outlet before you place any order, as there are some amazing savings to be made. For any large orders it may be beneficial to use their spread the cost offer, by signing up to a credit account. Find stylish menswear at Premier Man with everything from shirts, jeans, trousers, tailoring, coats and jackets, t-shirts, shorts and footwear. In the menswear section, there's great collections to choose from as well such as the great outdoors, the holiday shop and occasion wear. With these diverse collections and all the clothing options available you can find yourself casual, everyday fashion as well as sophisticated suits and smart menswear. At Premier Man, you never have to worry about finding a size to fit you as with sizes reaching 5XL or a 66" waist, there is something to suit every body shape. Don't forget to use one of our Discount codes in conjunction with your order at Premier Man and save yourself some money on your purchase at the checkout. 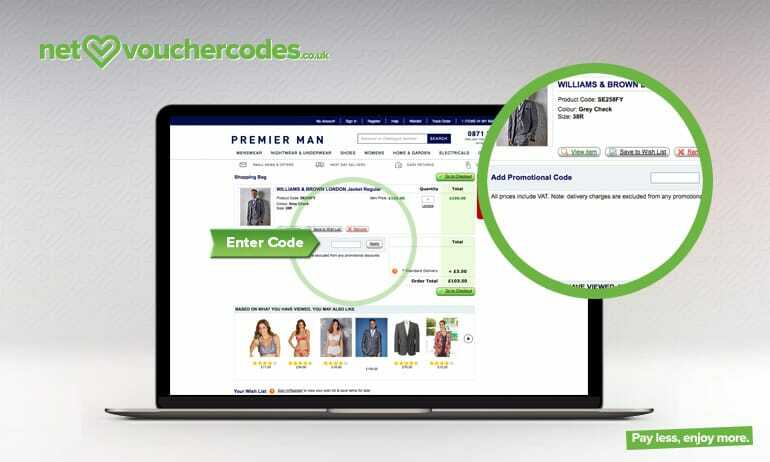 Here at NetVoucherCodes, we have a huge variety of voucher codes to help you save money on your online shopping. 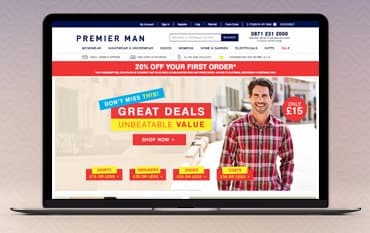 When shopping for the trendiest men's clothing and latest styles at Premier Man why not check out our discount codes and grab a bargain on your order. All you have to do is simply browse our Premier Man deals page and choose from all the biggest discounts and latest promotions available online. These include sales, offers and deals all with the intention of saving you money. With the help of us, all you bargain hunters out there can find yourself saving a fortune, no matter what your style, taste or budget! Premier men are the size and fit experts, so you can remain confident that the shoes you buy from here, will fit perfectly and feel amazing. Comfort and fit are the main priority when buying your shoes however a good price is also a great bonus. You can find a great variety of shoes from Premier Man in the sale where there's up to 60% discount available. Find all kinds of shoes with everything from boots, trainers, sandals, flip-flops, walking boots, slippers and accessories. Choose from sizes 2-18 and shop from big name brands such as Birkenstock, Adidas, CAT, Clarks, Clarks Originals, Hunter, Lacoste, Nike, New Balance and much more. Which couriers are used for delivery? Most parcels are sent via MyHermes, other couriers used include DX Freight and Royal Mail. Are the sizes true to size? To help with which size to order, just click the size guide link at the right hand side of each item page, this will give you a better idea of your best fit, along side a measuring guide. Yes, you will be able to track the progress of your order by logging into your account. Premier Man provides a hassle-free way to shop for clothes, shoes and accessories. Grab a Premier Man Promotional Codes for the best discounts and hottest special offers. You can find a huge selection of clothing, footwear and accessories from their catalogue providing outfits for men and women in all sizes. They also stock a wide range of Homeware goods and Electrical products including Furniture, Kitchen Appliances, Home Furnishings and much more. You can collect your order for free from over 5000 myHermes ParcelShops when you spend over £40. If you would like to spread the cost of your order, you can do this by applying for an account online, terms and conditions do apply.